ORWELL- Grand Valley’s newest business enterprise, Orwell Flower Shop has just opened at the same location as its predecessor-Cindee’s Flowers & Gifts, Route 45 south of the village limits.The new shop floral designer and manager, Jen Henry, worked with Cindy Pace in the former shop for the past four years. Pace closed her business earlier this fall. (From Nov. 30 edition). “Cindy held an auction to sell all her shop inventory. My brother-in-law Mike Meiner of Colebrook bought all of the inventory at an auction Cindy held. So now I manage and run it. It’s a nice family arrangement and I wanted to see a flower shop continue in our area. Before Cindy bought out the flower shop from the late John Rose and his wife. The Roses had their shop on Staley Rd. in Orwell and I worked for John for five years. Then I stayed on working with Cindy,” said Henry. Henry has always been creative. Working for florists like the Roses and Pace provided her with “training on the job”, she noted. “Every (floral) designer arrangement is different. And every one order you do is different. It’s what you see in your mind when working with flowers. I love the work and creating something different,” she said. Henry’s daughter Miranda and son Jacob attend Grand Valley schools though the family resides near Cortland. Miranda helps her mom in the store, too. Opening the Orwell Flower Shop just before Thanksgiving, Henry has been busy getting settled in the same location at 8220 Route 45 south. The new shop shares the building with the Northeast Ohio Farm Bureau offices and another small business. “Our services still include a lot of walk in customer orders, local delivery and I take out-of-town orders to other floral shops. I know this area well as I grew up in Colebrook and am a Grand Valley HS graduate. Before I got into the floral design career, I ran a car lot in Johnson Township in Trumbull County for five years. Doing this kind of creative work is my favorite,” said Henry. “I plan to have other gift items soon in our shop like homemade soaps and lotions plus Christmas holiday season items. Right now I have house plants and handmade evergreen and silk wreaths plus Norfolk Island pine plants,” she added. Henry and her brother-in-law Mike Meiner invite area residents to stop in at the reopened flower and gift shop. Shop hours are 9 a.m. to 5 p.m. Monday, Tuesday, Thursday and Friday; closed Wednesdays; and 9 a.m. to 2 p.m. on Saturdays. Look for their new shop sign to go up soon as well, said Henry. 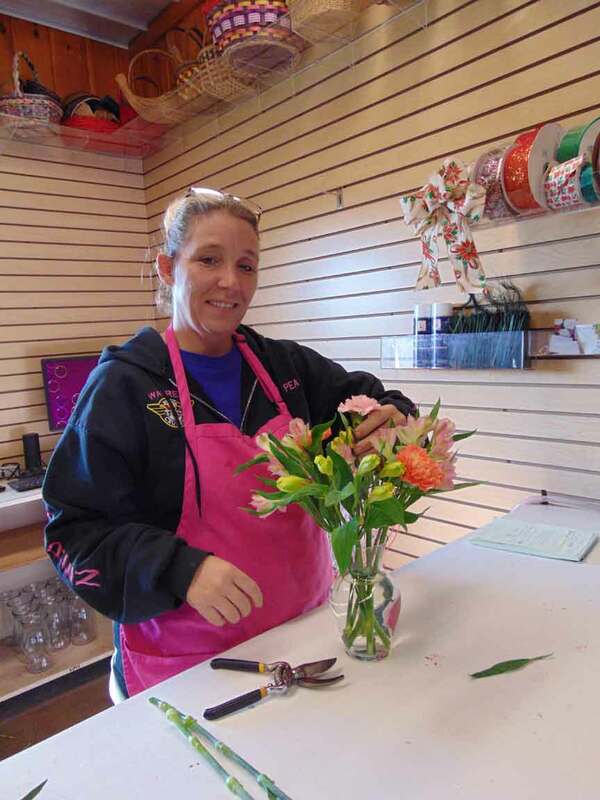 Pictured: Newly opened Orwell Flower Shop at 8220 Route 45 south in Orwell manager, Jen Henry works on one of many floral arrangements she keeps on hand for walk-in customers this past week. Opening just before Thanksgiving, Henry’s brother-n-law Mike Meiner owns the business and she manages the operation.